The market is trading higher after yesterday’s breakout. We are just above of resistance in the low 1430s after the market popped on the Fed’s announcement. It’s been one heck of a ride over the last 5 trading days as we bounced off 1400 and had 5 consecutive up-days, now looking at our 6th. It wouldn’t be surprising to see a down in the near future. In fact a little consolidation here would be healthy because going too-far, too-fast is unsustainable and leads to larger snap-backs. Many traders are suspicious of this rally and unsure what to do. They joined the crowd and sold stock after Obama’s reelection. They continue fretting over the Fiscal Cliff headlines and still worry about developments in Europe that everyone has seemingly forgotten about. Yet the market is oblivious to these concerns. What is a trader to do? Most rationalized it as a temporary bounce and it would come back down, but it’s been nearly a month and 85+ S&P points and the market is still going up. In the markets, price is truth and many cynical traders reconsidering their views. This is a perfect example of what happens when too many traders opinion’s cluster together. Efficient markets depend on independent opinions. Surprisingly it doesn’t matter if individuals in are rational or not, just as long as they are independent. Even when participants are irrational, if the irrationality is independent, the extremes on one side counteract extreme views on the other side. In an independent environment the irrationality cancels itself out and we are left we an efficient market. But what we had in the post-election selloff was a clustering of opinions. Rational or not, when groupthink hits the market, it skews prices and makes the market inefficient. But this isn’t bad for trader because this is our bread and butter. Inefficient markets create profit opportunities and without cracks to exploit, beating the market would not be possible. The situation we have now is pessimists suffering from doubt and an identity crisis. These turncoats are the new buyers that are pushing us higher, as both as short-covering and afraid of being left behind chasers. Up six days in a row might make the market vulnerable to a pullback, so anyone tempted to chase this market might wait a couple of days to find better prices. As we have seen time and time again, it is ruinous for your trading account’s health to be short this market. The trend is clearly higher and the easy trade is owning the market. 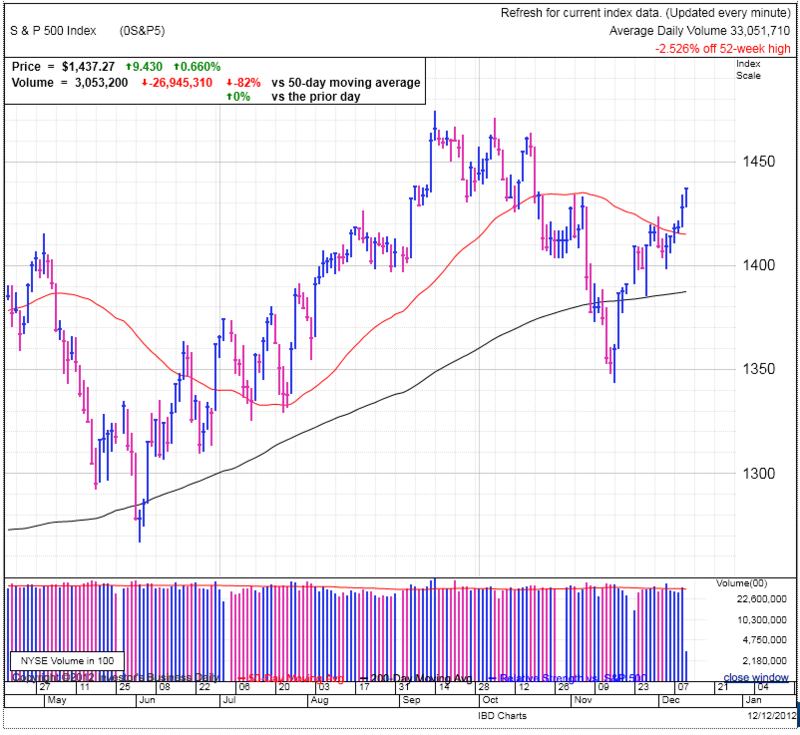 We should expect a pullback to the 50dma, but that will be a buying opportunity. The one snag to watch for is an emotional trade surrounding the Fiscal Cliff negotiations. Much like the Obama reelection, we could see some irrational selling, but that will be short-lived and create a buying opportunity. AAPL is again following the indexes, albeit with a lot more beta. The irrational selling seems to have abated. Most of the pre-tax increase selling has probably already happened too. Anyone contemplating locking in AAPL gains for tax purposes was likely pushed over the edge watching the stock nose over like it did. Most of the commentary surrounding AAPL is focusing on their weaknesses and what they are doing wrong and no doubt there is truth to these points. The iPhone finally has real competition from Samsung and is losing market share in the US, but lets not forget AAPL is an international story and how they perform overseas is what will drive the stock.